The retina is a nerve layer at the back of your eye that senses light and sends images to your brain. The vitreous is a clear gel that fills the middle of the eye. As people get older, the vitreous may pull away from its attachment to the retina at the back of the eye. Sometimes, the vitreous pulls hard enough to tear the retina. 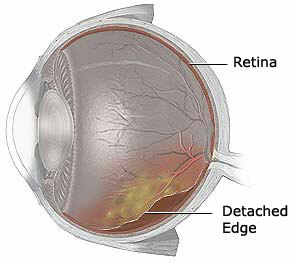 A retinal detachment occurs when the retina is pulled away from its normal position. The retina does not work when it is detached. Vision is blurred. 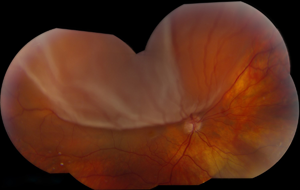 A retinal detachment is a very serious problem that may cause blindness unless it is treated. A few early symptoms may indicate the presence of a retinal detachment, including flashing lights, new floaters, and a gray curtain moving across your field of vision. However, these symptoms do not always mean a retinal detachment is present. If you experience any of these symptoms, call us as soon as possible to schedule an examination. If you are experiencing signs of retinal detachment, we will perform a medical eye examination in our office. After dilating your pupils, we will examine the retina using ophthalmoscopy, which allows a doctor to see inside the back of the eye using a magnifying instrument with a light source. Retinal tears need to be treated with laser surgery or cryotherapy (freezing), which seals the retina to the back wall of the eye. These treatments cause little or no discomfort and may be performed in the office. Treatment usually prevents retinal detachment. Almost all patients with retinal detachments require surgery to put the retina back in its proper position. Surgery is very successful at reattaching the retina with one or more procedures. Vision may take many months to improve and, in some cases, may never return fully. The more severe the detachment, the less vision may return. For this reason, it is very important to see your ophthalmologist at the first sign of any trouble.